After four years of work on reforming the street trade segment, Moscow authorities have launched a new project: Robot vendors are currently being introduced to the streets. The niche is novel for business and there are only two automatic machines out on the city streets to date. But market observers are confident the business will be profitable. Visitors to Moscow in the last few years may have been surprised to see that most of the street kiosks that were such a distinguishing feature of the city’s life had disappeared. Now the streets and squares of Russia’s capital are witnessing the return of the kiosk – only this time, it’s a robot. 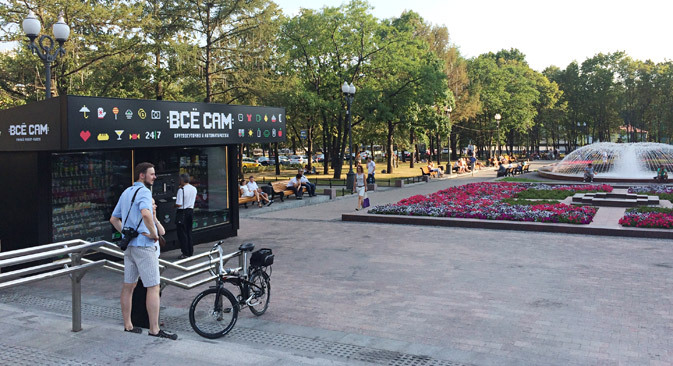 The first automated booth was opened as an experiment on Pushkin Square, in the very center of Moscow, in July. Instead of a window for a salesperson, the purchaser sees a screen with robot eyes. ‘Vsyo Sam’ ('All By Myself') is written in pixel font on a wide panel, and 200 item choices ranging from water and chocolates to headphones and shoe brushes are visible behind two glass panes. The City of Moscow is to invest 3.5 billion rubles ($98 million) into modernizing trade in the vestibules and underground passages of the capital’s metro. The project, which is projected to last through 2016, will see 96 stations re-fitted. Trade pavilions will be zoned and a separate are will be set aside for vending machines, ATMs, and terminals for payment of services. In 2010, the city authorities began to wage war on the traditional kiosks, tents, and stalls that cluttered city streets and the entrances to metro stations, shutting them down en masse. By the next year, the Moscow Committee for Architecture and City Planning had worked out a unified scheme for the placement of stalls, whereby their numbers were reduced by half – from 22,000 to 10,000. The Moscow authorities then gave some thought about how to develop vending trade and decided on trying a more modern concept of street commerce. It was proposed to set up over 60,000 street vending kiosks within the next few years: 26,000 on streets and squares and in parks; the same number at bus stops and in the metro and crossings, and 10,000 in courtyards and near supermarkets or shopping centers. However, at present there is no regulatory documentation that would allow for the setting up of automated vending kiosks on the street. So far, Vsyo Sam is the first company which has undertaken to develop this kind of thing. A pilot project, its initiator is entrepreneur Alexander Zolotarev, who heads the EPS group of companies that manufacture trade and coffee vending machines. The robotic kiosks are also gathering in the Moscow Region. Market participants assess the cost of one machine at $40,000. In the near future several more kiosks will appear in Moscow, but they will also be temporary as part of a pilot project. According to his calculations, one Vsyo Sam should pay for itself in 1.5-2 years (if approximately 200 items are sold per day). The robot kiosk’s lifespan is 15 years. In the opinion of the president of the National Association of Automated Trade (NAAT), Boris Belotserkovsky (he heads another of Russia’s largest vending companies, Uvenco), if vending kiosks become popular channels for street trade it will happen within five years. Belotserkovsky notes that the majority of vending company kiosks like the one placed on Pushkin Square are unaffordable. At the same time, the most expensive vending machine intended for placement in Alexander Zolotarev’s EPS company catalog is 345,000 rubles ($9,600). The proportion of vending in total retail turnover is small, but global experience confirms that it can reach 5 percent and for some groups of goods, 10 percent. In Russia, according to NAAT’s data, the market turnover for vending machines is approximately 22 million rubles (about $600,000). The total number of machines in the country is 139,000 a significant percentage of which are installed on commercial premises. Like everywhere in the world, they not only sell drinks and snacks but there are also units for purchasing contact lenses, dog food, flowers, iPhone covers, and much more. The five largest Russian vending companies – Uvenco, SIBA Vending, Comm Pass, Assorti, and Vendex – control about one third of the market. Other companies are mostly small businesses that are still more comfortable with having a sales space. Market participants say that investments in the units used to be between 200 and 500,000 rubles ($5,000-14,000) but that over the past few years, followingthe appearance of Russian machines of acceptable quality, the price dropped to 150,000 rubles ($4,000). The average revenue of a machine, based on the calculations of one of the largest Russian operators, is about $200 to $400 per month (depending on the traffic). Operating costs are about 60 percent of the machine’s sales and rent payments cost about 5-10 percent. The average time it takes to recover the cost of a unit is 1 to 1.5 years. In 2014the Japanese company DyDo entered the Russian market. This firm’s vending machines have already made an appearance in the underground passages between three Moscow stations and there are 13 vending machines in total. The machines sell Japanese beverages, cold and hot drinks like coffee, tea, different-flavored sodas, and juices with and without pulp – approximately 20 choices altogether. The company is planning to build up a vending machine network, setting them up atother pedestrian crossings as well as in metro station vestibules and at railway stations, bus stops, and city parks. It is planned to increase the number of vending machines to 500 in 2014 and to 10,000 by 2018. First published in Russain in Kommersant Dengi.